Electric motorized commuters like skateboards and kick scooters are getting very popular nowadays. People are switching to these eco-friendly options rather than getting a gasoline-hungry motorbike or a physically exhausting bicycle. Now for any product which is to be used daily, along with the technological aspect, the comfort of the rider is also a major factor. So companies are making these electric scooters and also putting a seat on them so that you don’t have to stand and ride anymore. The way these companies are installing the seats in those portable commuters is really very unique and from the design perspective, it’s stunning. But again, when you go in the market to get one of those for you, you might get really confused as there are so many products available. So to help all the potential consumers like you who are willing to own one of these toys, let it be for day-to-day use or just for a fun ride, we came up with the list of ten best eco-friendly electric scooters with a seat on them which are currently the best in the market. Let’s not beat around the bush anymore and directly jump to our list. We have listed many types of seated scooter here in our list, but URB-E aced among all because of its uniqueness. URB-E first launched the prototype at CES 2014 but that was too slow and weak to be really useful on the rugged street. But with their final version available to the consumers, they have taken a big leap. URB-E is not cheap. But the quality product they are offering is definitely worth every penny. The scooter is very well built with both carbon fiber and aluminum. The use of these materials also helped to keep the weight of the scooter only 35 lbs, which is very light considering the seated scooters. The design of this scooter is very unique and it’s not something we see on the street daily. This rare design also made the scooter very compact and it is easily foldable into an easy carrying commute while not in use. This portable scooter is powered by a 250-watt brushless motor attached to its front wheel. The motor is powerful enough to boost the scooter up to a speed of 15 mph. The scooter is also packed with a 36-volt Li-ion battery which can take you to a maximum range of 20 miles. The battery is easily rechargeable and takes almost 4 hours to get fully charged. This scooter is equipped with a 250-watt brushless motor which is capable of generating enough boost to get a maximum speed of 15mph. The 36-volt Li-ion battery gets fully charged in almost 4 hours. With a single charge, this scooter can take you up to a range of 20 miles. The body is made with a combination of carbon fiber and aluminum. Both of these materials are very light yet strong. The scooter weighs only 35 lbs but can support an adult up to a weight of 250 lbs. The scooter has a disc brake attached to the rear wheel and the motor is attached to the front. URB-E has some very cool features like USB port to charge your phone on the go and a coffee cup holder as well. The scooter also has a basket attached to the back which may come handy after a little grocery shopping. 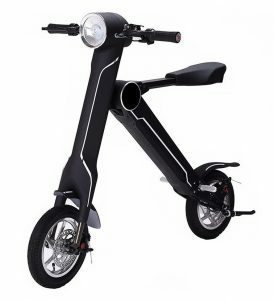 If you are looking for a foldable and also affordable scooter which does not compromise on the features, then Black Super Turbo is probably the best choice for you. The first noticeable thing about this scooter is the sprockets fixed to it. Those are huge monstrous wheels and can go on any surface. A True Unite 1000-watt motor is used to power this scooter. This motor produces 3000 rpm and can easily speed up the scooter up to 26 mph. This scooter can also give you a range up to 18 miles, thanks to its 36-volt battery. Black Super Turbo also has disc brakes attached to both rear and front wheels. Despite all the good features, this scooter has a few noticeable flaws too. Black Super Turbo has a deep cell lead acid battery. No doubt lead acid batteries are no competition to Li-ion batteries but a Li-ion battery comes with a price too. Another flaw of this scooter is it is not waterproof. So before going out sitting on this ride, you have to check the weather too. Although the manufacturer claims that this scooter can easily handle a person weighing up to 300 lbs, in reality that is only true on flat surfaces. On a bit hilly road, the performance of this scooter degrades drastically and sometimes you may even be forced to walk because it can be too slow to ride on. This scooter has a True Unite 1000-watt motor that produces 3000 rpm. The motor is connected to the rear wheel with a heavy duty chain. It can boost the speed up to 26 mph which makes this scooter faster than most of the scooter in the market. The 36-volt lead acid battery can give you a range of up to 18 miles in a single charge. Compared to its competitors, this scooter is more comfortable to ride. The seat is very comfortable and you also get an option to choose the size of the seat. The dual rear shocks and the extra wide tires also enhance the comfort even on a bumpy road. This scooter is easily foldable but very well built. You also get an option to choose between Turbo and Eco mode. It also has a LED head light. Razor is an old player in the manufacturing of electronic commuters. Razor E300S is the seated version of Razor E300. 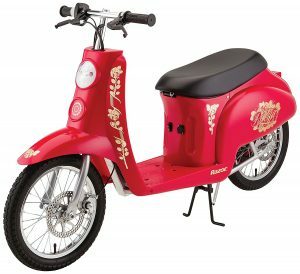 It is one of the most famous seated scooters as it’s offering a lot with a bare minimum price. The frame of this scooter is very nicely made with steel and rigid enough. The seat is comfortable enough for an adult and is detachable. So you can just detach the seat and ride it like a kick scooter. Razor E300S is driven by a high-torque motor and the power is transmitted to the rear wheel with a chain-drive system. This scooter can reach up to a speed of 15 miles per hour. 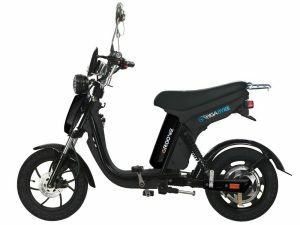 The scooter is powered by a 24-volt lead acid rechargeable battery pack. This battery can run the scooter up to 40 mins on a single charge based the riding condition. But the disappointment is that the battery takes almost 12 hours to get charged up. Razor put 10-inch pneumatic tires on this scooter which are good enough to move the scooter even on rocks and pebbles. Only one brake is attached only to the rear wheel and it works okay. Just like E300, Razor E300S also is not quick foldable. So it is only good enough to ride for fun. A 24-volt lead acid battery pack is powering this scooter and can run the scooter continuously for 40 mins on a single charge. A chain-drive system is used to drive this scooter. It is a rear wheel drive. The single brake works okayish but misses few times. The 10-inch pneumatic tires are good enough for little rough roads too. Razor EcoSmart Metro is simply different. This scooter features some very simple but rider-friendly features and also looks good. The frame of this scooter is made of steel but the deck or the footrest is made of bamboo which looks appealing at the first glance. The tires of this scooter are the reason for which this scooter looks so beautiful. They are 16-inch standard bicycle style pneumatic tube tires on spoke wheels. These are very easily replaceable. There is also a luggage rack attached to the back of this scooter. It is also equipped with a 500-watt extra high-torque motor attached to the rear wheel. EcoSmart Metro can easily gain speed up to 20 miles per hour. A battery pack of 36-volt potential is powering this scooter and this can give you 60 minutes of continuous ride. But again just like Razor E300S’s battery is a lead acid, this also takes 12 hours to charge fully. The design of this scooter is very appealing. It is equipped with a 500-watt extra high torque motor which can speed this up to 20 miles an hour. The battery is a 36-volt lead acid one and takes too long to charge. It can power the scooter up to 60 minutes continuously on a single charge. The bicycle styled wheels look nice and also easy to steer. The seat of this scooter is extra padded and is very comfortable. Only a single disc brake is there at the rear wheel. There is no indicator for the battery health. SO you have to be careful when you go out on this. Razor E200S and Razor E300S are from the same product line of seated electric scooter by Razor. E200S is the model just a place below the E300S, so they have almost the same specifications and features but only a very few missing on E200S. Just like the E300S, the E200S is the seated version of Razor E200. But again this scooter can be used just fine with the seat removed. The motor in this scooter is less powerful than the E300S and can boost the scooter up to a speed of 12 miles per hour. Similar to E300S, the motor is attached to a chain-drive system which transmits the power to the rear wheel. Razor packed a similar battery in both the scooters. The tires also show that this is a downgraded model to the E300S. This has 8-inch pneumatic tires compared to the 10-inch on E300S. Its braking system is just like the elder brother and so are the controls. The built of E200S is also very similar to the E300S but this scooter has been a bit trimmed down in the dimensions. This scooter more fits for teenage children rather than adults. The top speed of this scooter can reach up to 12 miles an hour. It has 8-inch pneumatic tyres. The battery pack is again 24 volt and can give power to the scooter for up to 40 mins on a single charge. CleveYoung has made one of the best nice looking foldable seated scooter. The design of this scooter will definitely attract your eyes to have a look at it for the second time. The design is unique and helps this scooter to fold very quickly and efficiently. 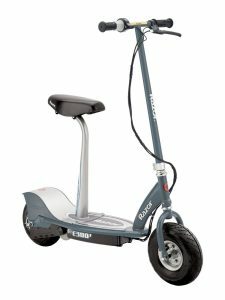 The body of this scooter is made of aluminum alloy which helps to keep the weight of a unit only 40 lbs. But at the same time, this scooter is very strong and is the perfect ride for someone weighing even up to 250 lbs. The scooter is powered by a 36-volt brushless motor and is a rear wheel drive. This motor is powerful enough to take the speed up to 15 miles an hour. 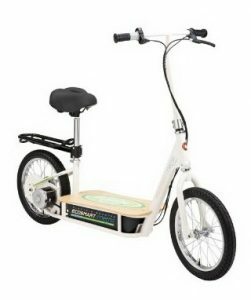 This bike is packed with a Li-ion battery manufactured by Samsung (Samsung is one of the best Li-ion battery manufacturer in the market). This battery provides a maximum range of 30 miles on a single charge which is more than any other electric scooter in this list. This scooter also has a bluetooth speaker in it. Yes, you read it right. I don’t know how useful this feature is, but in anytime if you want to listen to any music on a speaker, just pair your phone and you are good to go. It also has USB charging point, so you can also charge your phone while riding. The Samsung made Li-ion ion battery gives you a range of 30 miles. This battery also gets fully charged up in 5 hours. The 36-volt brushless motor can take the speed up to 15 mph. For safety, disc brakes are attached to both front and rear wheel and they work very well. The scooter weighs only 40 lbs. This makes the scooter very easy to carry with when you are not riding. The scooter is also very easily foldable. This scooter has a bluetooth speaker inside it. It also comes with a smart remote key to lock and start the scooter. This also has a headlight and a large display to show multiple parameters like speed, battery level, and even temperature. This scooter also has an IPX5 certification for water and dust proofed. 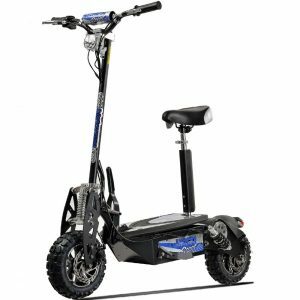 Uberscoot 1600 is a very sturdy and rugged looking scooter. The company has a couple of other models of scooter too but Uberscoot 1600 is the most powerful one. This scooter has a 1600 watt brushless motor and it is very quite. The motor is attached to the rear wheel with a chain-drive system and can speed the scooter up to whopping 28 miles an hour, which is very good for a scooter like this. A 48-volt battery system consisting of four 12-volt, 12ah batteries is powering this scooter. The scooter can give you a range of up to 12 miles with a single charge. The scooter also has an Eco mode button. 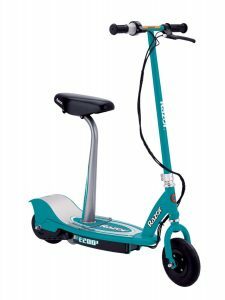 In the Eco mode, the scooter reduces the motor power and can take you up to a much longer distance. This also features 12-inch pneumatic knobby tires. These are off road tires which are very rugged and can go smoothly on rough surfaces. Two disc brakes are attached to both the wheels and work pretty well. This is very well built with aluminum and can take a weight of up to 250 lbs. You can also fold this scooter very easily and carry it around. 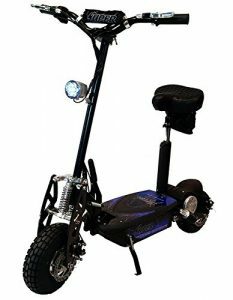 This Uberscoot is equipped with chain drive system attached to a 1600 watt brushless motor. The top speed of this scooter can go up to 28 miles an hour. The battery pack is made up of four 12 volt, 12 ah batteries and together generating a potential of 48 volts. The scooter can go up a range of 12 miles on a single charge. The Eco mode put the scooter on a power saver mode and reduces the acceleration and top speed so that you can cover a little bit more on this. This scooter also has onroad/offroad 12-inch pneumatic knobby tires attached to both front and rear position. These are very rugged tires and you can easily go to any rough terrain without any hesitation. For safety, this scooter has disc brakes attached to both the wheels. 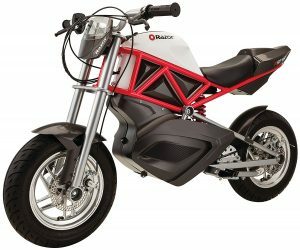 Razor has probably more options in electric motorized commuting vehicles than any other brand and they also brought products with very different styles. Razor RSF650 Street Bike is the most different one from any of the other products listed here. It is simply an electric motorized bike. RSF650 looks just like a naked street bike, only a smaller version. The chassis of the bike is made of steel and is fairly rigid and strong. The bike can handle a weight up to 220 lbs which mean not only a teenager but a full grown adult can also enjoy riding this little toy. Though I doubt anybody can use this bike on a day-to-day basis. The 650-watt high torque motor is powerful enough and is fixed to a chain drive system. The power is delivered to the rear wheel just like a bike. The top speed can reach up to 17 miles an hour. The 10 spoke wheels are made of magnesium alloy and 12-inch tires are the street grade. The tires had enough grip and provides a quality handling to the bike. Again just like any other Razor product, this bike also features 36-volt lead acid battery pack. Razor is probably using the lead acid battery on each of their products just to reduce the cost which may be good and bad at the same time. There is also a charger compartment in this bike. The braking system looks promising with two disc brakes on both the wheels. But again there are no indicators of any kind in it. There is a 650 watt high torque motor powering this bike and it can run up to a speed of 17 miles per hour. The spoked wheels are very good looking and made of magnesium alloy. The 12 inch tires are street grade and ready to go on any road. This scooter comes with a 36 watt lead acid battery pack which takes almost 12 hours to charge. This can also give you a riding time of 50 min on a single charge. There are two disc brakes attached to both the wheels of this bike. 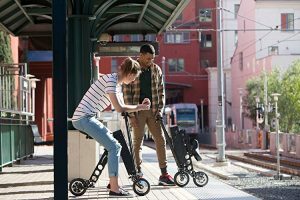 Gigabyke Groove is a full-size non-foldable scooter or to put simply, it is a moped. This is an eco-friendly alternative to all the gasoline-powered scooters. This is perfect for the small city and small commuters who are looking for a way to ride without premixing gas. The Groove is a 750-watt electric motorized bike and goes up to 20 miles per hour. It has a 48 volt, 14 ah battery. This battery can provide a maximum range of 35 miles on a single charge and it takes 6 hours to get fully charged. This scooter also has manual paddles which may come handy in case the scooter gets fully discharge on the way. The Gigabyke Groove can take weight up to 250 lbs. You can comfortably take a baby or a toddler to ride with you in this scooter. Since it is a full-size scooter you don’t have to compromise in the handling. This scooter has a 750 watt electric motor. The top speed of this scooter can reach up to 20 miles an hour. It is packed with a 48 volt, 14 ah battery which gets fully charged in almost 6 hours. The range of this scooter is almost 35 miles. 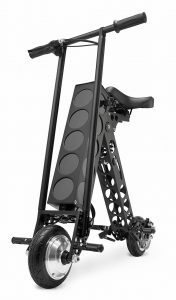 This is a full-size scooter and can take weight up to 250 lbs. Razor Pocket Bellezza mod is classic Italian style scooter specially made for the female riders. With custom artwork on the body, this scooter looks very fashionable. This scooter is equipped with a 500-watt high-torque motor which a chain-drive system. The top speed of this scooter is 16 miles per hour. The battery pack in this scooter has three 12 volt batteries together providing 36 volt of potential. These are lead-acid batteries and take 10-12 hours to charge fully. Once charged, you can ride on this scooter for 70 min continuous without the need to plug it into a charger. The wheels are spoked and look nice. 16-inch pneumatic tires are there around those wheels. Each wheel also has its own disc brake. This scooter also has a headlight, so no worries if you want to take a ride after the sunset. This scooter can take a load up to 220 lbs and there is enough room to accompany a baby or a toddler along. It has a 500 watt high-torque, chain-drive motor powering the rear wheel. The top speed of this scooter can go up to 16 miles per hour. The 36 volt battery system in this scooter can run it up 70 minutes. The spooked wheels look gorgeous and 16 inch pneumatic tires make it really easy to handle. If I have to get a bike, I would go for CleveYoung cBike. This bike has everything and I don’t have to compromise in anything with that one. It is foldable, comfortable to ride on, good battery and what not. Hey, remember I picked that bike because I want to use it everyday and not just for fun. So, pick yours too reasonably. While buying any electric motorized vehicle, please check with your local authority if it’s legal to ride these in your area or country. In many places, you need a proper driving license to ride any electric motorized vehicle which can go above a certain speed. This speed limit may vary from place to place. In many electric motorized commuting vehicles, the motor is locked to gain speed up to a certain limit even though the specs sheet says the top speed to be much higher. So you must always check with the manufacturer about such restrictions before buying.